You never know what you’re going to find in a statute book. The Legal Genealogist is the daughter, granddaughter, and great granddaughter of Texans, so it’s always fun to have time to poke around in old Texas records. And I was poking around last night in a book of old Texas laws. 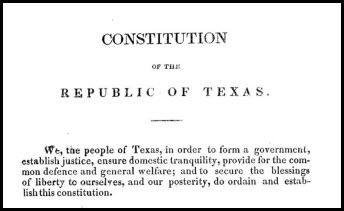 Really old Texas laws — those of the Republic of Texas. Not because I was looking for anything in particular but just because it’s fun. You never know what you’re going to find. Like the story of John T. Mason. Right there, in the front of volume I of this two-volume set of Texas Republic laws, is the Constitution of the Republic of Texas. So… who was John T. Mason and what was wrong with his … um … land grab? And then came the land situation. And it was John Mason’s job to represent this company and see to it that everything went smoothly. Except for one little hitch. Here we have the story not just of one man, but of a company, its shareholders, the immigrants it brought to Texas, all their land grants and titles and the years of lawsuits that followed as people tried to settle who owned what. And all from one small paragraph in one small section of a single document in a set of statute books. My husband’s g-g-grandfather, Joseph T. Killgore, was on a committee appointed in 1839 to clear up all the land fraud claims in Texas. A few years ago, Jerry Patterson was Texas Land Commissioner, and he was writing a book about all the men appointed to this committee. There were three from each county. Killgore was from Harris County, home of Houston, Texas. I don’t recall seeing his book. That is very cool, Betty! I looked in Worldcat and don’t see such a publication… but boy it’d be nice if it ever was published!